The better your components, the better your chair. 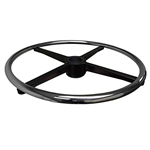 At Perch, we stock a handful of high-quality casters, glides and foot rings for our chairs and stools, and are compatible with most seating brands. With Hard Floor Casters, Soft Floor Casters, Reverse Brake Casters, Glides (stationary caps) and ESD Reverse Brake Casters, we’ve got everything you need to change, upgrade or replace your existing components. If you can’t find the products you are looking for here, contact us – we'd love to help.